tilt the radio up. There are 2 light weight metal knobs on the front along with a larger VFO tuning knob. The knobs all have a push to select feature which is used to select various functions and features of the radio. Along with with a backlit LCD display there are 6 small plastic function buttons. The blue backlit display is bright and easy to read. A good bit of operational information can be shown on the display along with a bar type S meter and frequency display. When in transmit mode the LCD backlight will change to red (don’t worry this can be turned off if it bothers you) or display green when the “remote” mode is available. The built in speaker is quite small. The speaker can get fairly loud for indoor use, but for noisy environments you may want to use headphones or an external speaker. Due to the small size of the built in speaker, the audio is going to be a bit limited, but perfectly useable. Again an external speaker or headphones will extend the audio frequency range tremendously. Overall, no real complaints about the build quality. The FDM-DUO appears to be pretty solidly made overall with a clean modern design language. Oh, the FDM-DUO can also be bought in bright red case. How cool is that! Even though it’s small, the FDM-DUO doesn’t skimp on connectors. increase the flexibility of the FDM-DUO. This “thinking outside the box” approach is often reflected throughout the hardware and software design. 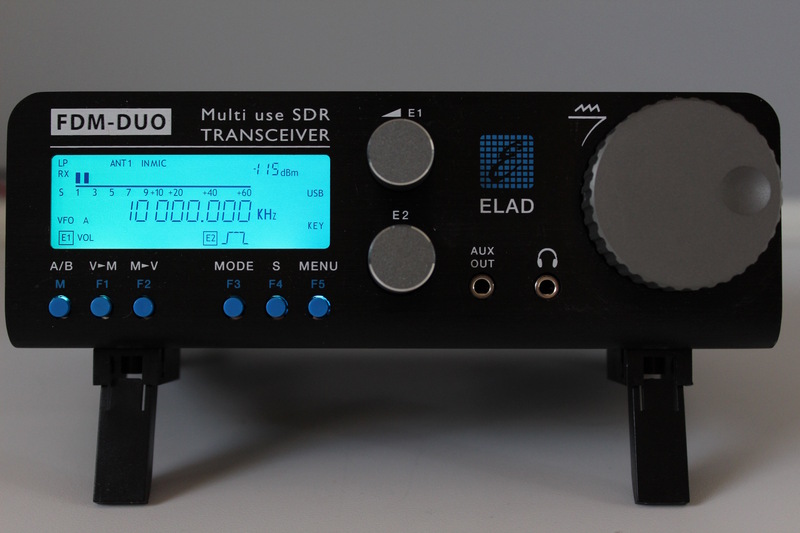 Again, designers of future SDR products should take a few lessons from Elad. The USB jack labeled RX is primarily used by the FDM-S2 for access to the IQ audio and hardware control. The CAT USB connection allows 3rd party applications to control the FTM-DUO’s hardware and appears to the computer as a serial port. The CAT USB connector supports the TS-480 CAT protocol. The TX USB connector is actually a line in and line out connection. The TX USB connector will show up as an audio device to the computer allowing you to route audio in and out to 3rd party programs. The line out output level can be adjusted by using the Auxiliary Out setting from the FDM-DUO’s menu section. 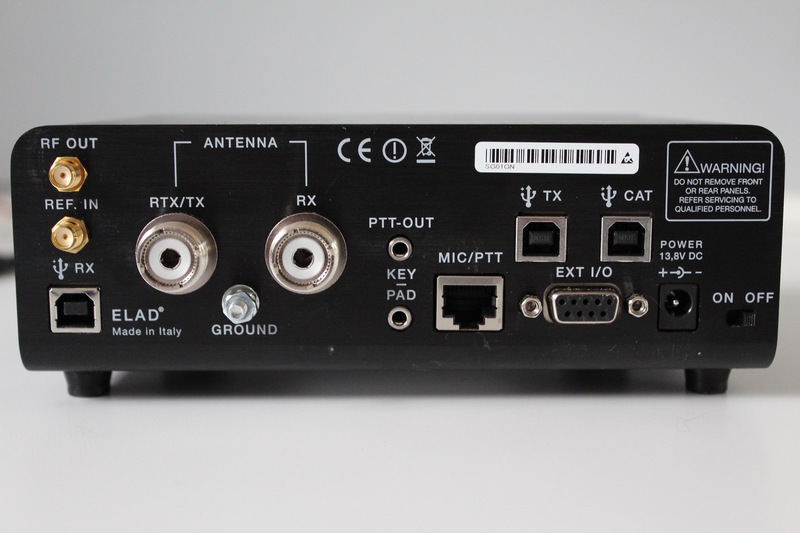 Antenna Conectors – There are four Antenna connectors on the back of the FDM-DUO. There are two PL-259 connectors for antenna connections. One connector is for a RX / TX antenna and the second is for an RX only antenna. 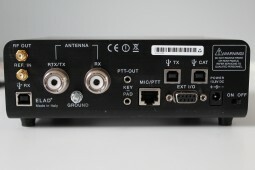 The antenna connections can be switched off and on via the FDM-DUO’s menu or through the FDM-S2 software. When both antenna connectors are selected, you can use two antennas, one for transmit and one for receive. There are also two SMA antenna connectors provided on the back panel. One is RF Out which is a 0dBm connector that will put out approximately .01 Watts. This is useful for possibly external interfacing to other equipment or as a test signal generator. The other SMA connector is labeled Ref In and can be used along with a 0dBm 10MHz reference signal. Ground Connector – for establishing a ground connection. PTT Out – This 3.5mm jack can be used to switch on an external power amp transmitting. Key / Pad – Nope not a keypad connector, but a 3.5mm jack for connecting a CW key or paddle. Mic / PTT – RJ45 jack used for connecting an external mic to the FDM-DUO. The external mic can used to transmit in standalone mode as well as through the FDM-SW2 software. EX / IO – A 9 pin connector allowing for the future connections for Elad add on equipment or from 3rd parties. Power On / Off – Main power switch for the FDM-DUO. You do have to get used to reaching around to the back left corner to find the small slide type on and off switch. It would have been a bit nicer if it was on the front panel or power could be controlled via one of the front panel knobs. Aux Out – Can be used to send audio to an external speaker. The volume can be adjusted via the menu. Headphone – Headphone jack with the volume controlled by the transceivers volume knob. The headphone jack is a bit close to the VFO knob, so you might want to use a right angle adapter on this one. Since the radio is small, buttons are kept to a minimum. Actually this is a nice change from small radios that tend to fill up the front panel with tons of small buttons. 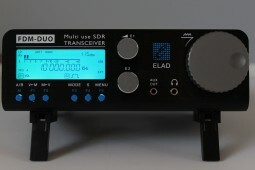 The designers of the FDM-DUO did a nice job in making the transceiver easy to operate with a minimum of buttons. Everything is done with the three knobs and 6 small function buttons on the front panel. The knobs can change settings by pushing to view the items that can be changed, rotating the knob to view the settings, and push again to set. The E1 (7 settings) and E2 (3 settings) knobs are assigned frequently used settings, so that you don’t have to rotate through a long list of items to say set the noise reduction for example. On startup E1 is set to volume and E2 to filter. When VFO knob is pushed you can quickly change the tuning step size from 1Hz to 1KHz by rotating the VFO knob and then clicking to set. Pretty handy. The six blue buttons along the front can be pressed once to activate the feature indicated by the white labels above them. Holding a blue button down longer will activate an additional feature. For example when using short presses on the Mode button it cycles through all the receive modes available, but when pressed an held it activates the Tune feature. Pressing the menu button gives you access to 85 adjustable parameters. Not to mention one is a reset setting to set the settings back to their default in case you get carried away with changing the parameters.